The short answer is yes—absolutely. ICR (and all Christians) should represent Jesus and His gospel as best as we can. There will never be a shortage of good Christian causes and projects that need support. But financial considerations, while important, are only one aspect of “counting the cost.” We should also weigh the potential for outreach, cultural impact, sustainability, and opportunities for greater and more effective ministry. The ICR Discovery Center will possess distinctive features that make it an especially worthy project for the cause of Christ. ICR is always mindful that we represent Christ here on Earth (2 Corinthians 5:20). Not only is Jesus our Savior and Redeemer, He is also the Creator who spoke the heavens into existence (Psalm 33:6) and walked with Adam and Eve in the cool of the day (Genesis 3:8). And this same Jesus will one day return in great power and glory as King of kings and Lord of lords (Revelation 19:11-16). With this perspective, ICR (and all Christians) should represent Jesus and His gospel as best as we can. God has brought us world-class designers and craftsmen capable of creating a magnificent facility, and the displays and exhibits within the center will reflect the highest level of excellence available today. Such expertise can be expensive, but in view of the people we can reach with the truth, the costs are inconsequential in terms of eternity. How many will we reach? Conservative estimates by industry experts expect 100,000 visitors each year, and a sizable majority of these will be school-age children. Moreover, where churches generally reach the same audience week after week, people not normally inclined to attend church will welcome a visit to the ICR Discovery Center. This, coupled with the natural turnover of students as they age out of their school years, will enable the ICR Discovery Center to reach new generations over time. The potential to positively impact our culture is enormous, and we are excited by the opportunities for a more effective witness. 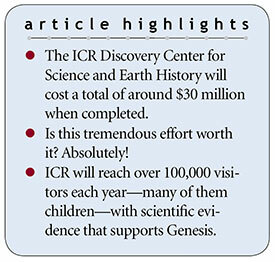 In the end, ICR has two primary objectives that will be greatly enhanced by the ICR Discovery Center. The first is discipleship: We encourage the faith and witness of fellow believers with the scientific evidence that supports God’s Word. The church today does a poor job in this regard, and many Christians remain ignorant of the powerful evidence that confirms the clear biblical account of recent and special creation. The second is evangelism: We shatter the myth that science has proven the Bible wrong, and we point seekers to Jesus, our Creator and Savior. Judging by the countless testimonies we’ve received, God uses ICR’s work to draw many people to Christ—a tremendous blessing we pray will continue to grow once the discovery center opens next year. We shatter the myth that science has proven the Bible wrong, and we point seekers to Jesus, our Creator and Savior. Yes, ICR has counted the cost, and it isn’t only about money. As A.W. Tozer once wrote, “As base a thing as money often is, it yet can be transmuted into everlasting treasure.…Whatever is given to Christ is immediately touched with immortality.”1 Please prayerfully consider joining with us. Your earthly investment with ICR today will impact lives for eternity. Tozer, A. W. 1987. Born After Midnight. Chicago, IL: Moody Publishers, 128. Cite this article: Henry M. Morris IV. 2018. Counting the Cost. Acts & Facts. 47 (7).